This charming boutique-style 4* hotel, part of the Hilton Doubletree brand, is located on the south coast of Mahé Island, just 20 minutes from the main airport. It is set in landscaped gardens, beside a superb beach and beautiful lagoon and surrounded by lush tropical foliage. 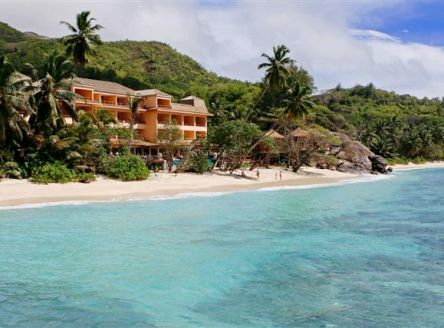 Part of Hilton’s Doubletree brand, this small hotel offers all the comforts of an enchanting island resort combined with casual elegance and affordability. Two room types – Ocean View and Deluxe Jacuzzi Ocean View – feature stylish décor and are rich in comforts including king-size beds, iPod dock, LCD TV, complimentary internet access and espresso machines; the larger deluxe rooms also have a Jacuzzi bath. 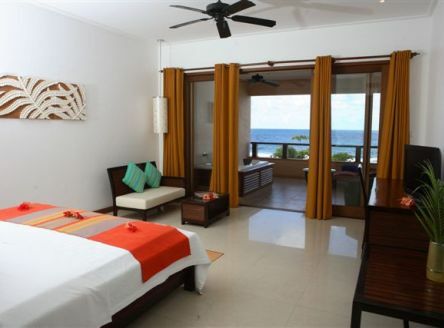 All rooms have fine views of the turquoise Indian Ocean waters and include private balcony with relaxing day-bed. Les Palms Restaurant offers classical Mediterranean, Italian and International cuisine as well as local Creole favourites, with options of indoor or 'alfresco' dining on the outside deck. It also features an open ‘show kitchen’ where chefs prepare daily specials. Afternoon tea and pastries are offered in the Ocean View Bar including no less than seventeen varieties of Sri Lankan tea. The bar also offers snacks throughout the day from the all-day dining menu. 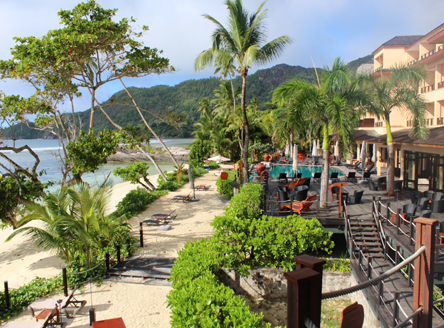 The resort's Duniye Spa is perched on a giant granite boulder beside the ocean. There are three treatment rooms with experienced therapists providing a complete menu of health, beauty and wellness treatments. These include Ayurvedic and massage treatments, body wraps and scrubs, as well as facials, manicures and pedicures. The hotel is located in the quieter south of Mahé Island and perfectly located for exploring it's quieter bays and small villages. 30 air-conditioned rooms: Ocean View (58m²) and Deluxe Ocean View (70m²) all with bathroom including walk-in rain shower, kingsize bed, living area with small sofa, ceiling fan, LCD TV, iPod dock, complimentary internet access, mini bar, tea/coffee/espresso facilities, safe, hairdryer, iron/ironing board and balcony with day-bed. 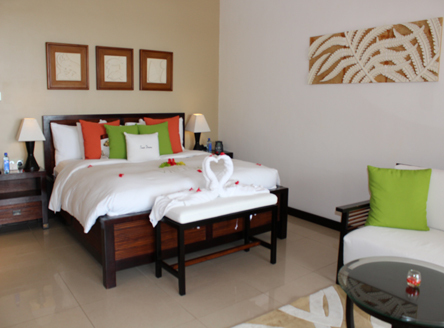 Deluxe Ocean View Rooms also include an antique-style bathtub, dressing/wardrobe area and a Jacuzzi bath. 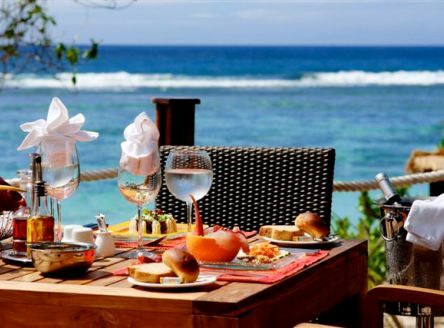 7 nights Bed & Breakfast in a King Guest Ocean View Room from £1,259 per person. Get 20% Discount valid throughout season for bookings made 90 days prior to departure. 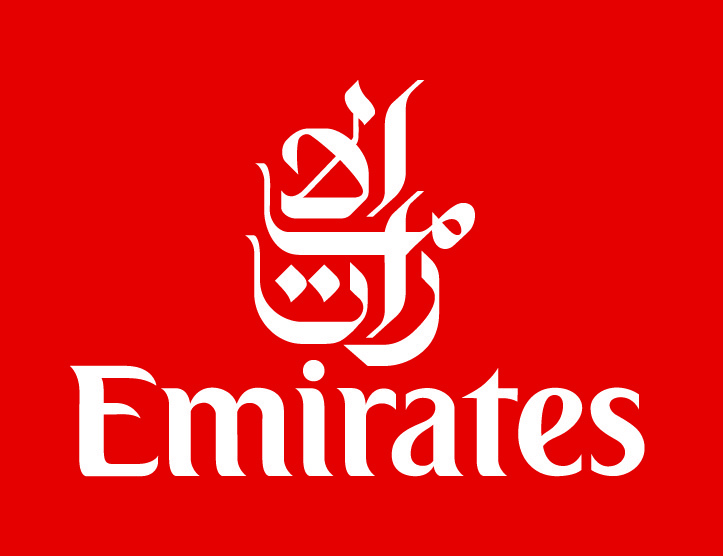 Get 15% discount for bookings made 15-89 days prior to departure. Valid throughout the season for min 7 consecutive nights stay throughout the season. 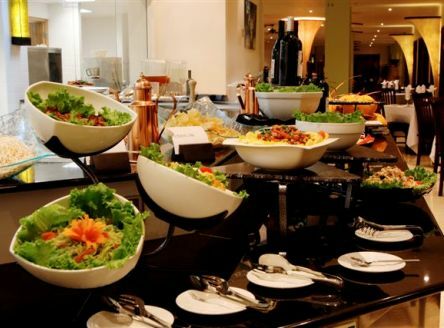 Get 25% reduction on the room rate on Meal Plan booked. 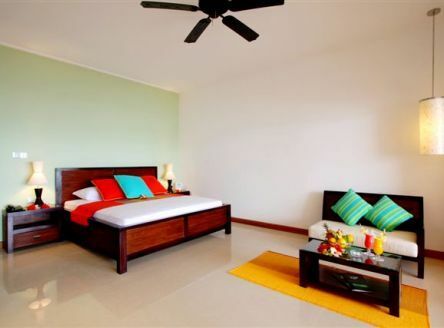 Small hotel in the quieter south of Mahe Island providing casual elegance and affordability. Has just been totally refurbished by Hilton in 2013. "Definitely worth upgrading to a Deluxe Room for the spectacular sea-views and Jacuzzi on the balcony. Enjoy the great sleeping experience offered through Hilton Double Tree’s “Sweet Dreams” experience. And don’t forget the trademark cookie on your jumbo pillows every night!" Why not combine Hilton Doubletree Allamanda with a fabulous Catamaran Cruise? 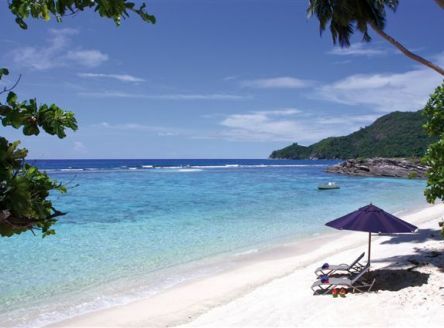 A stay at the Hilton Doubletree Allamanda makes a great combination with one of our superb Seychelles Catamaran Cruises. We can tailor any 'Cruise & Stay' package, from luxury resorts to boutique hotels.